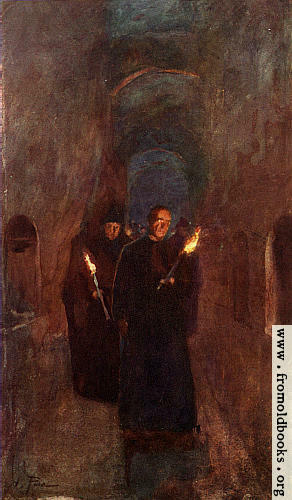 “If those who had inscribed the proud words round the dome of S. Peter’s has known that hidden in the catacombs there were frescoes representing Peter as the new Moses striking the rock from which flow forth the saving waters of Christ—the name Petrus clearly written above him—even they must have thrilled with wonder and awe: the upholders of Petrine primacy could not have imagined or devised a parable of the first centuries better fitted to their hand. The burial-places of the first Christians in Rome were their only certain property. The law allowed to every corporation its religiosus locus, its God’s acre, property seldom confiscated even in the worst hours of the great persecutions. 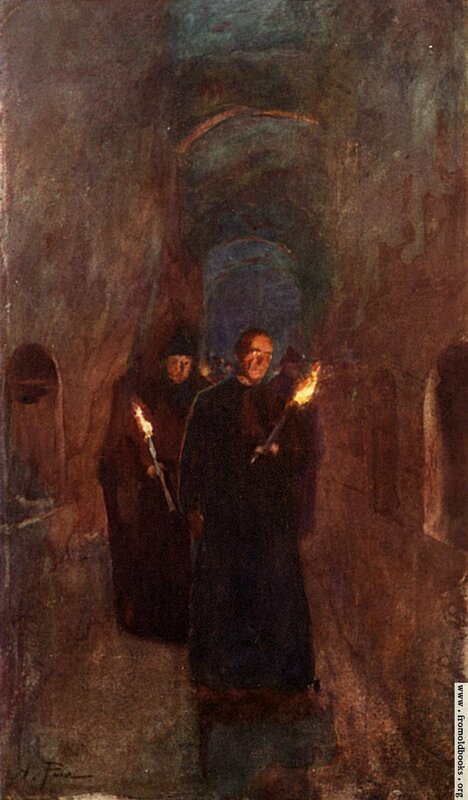 It was thus that the Christians, though they never lived in the catacombs, came to regard them as retreats, as places where it was safe to meet for prayer, for mutual encouragement, even for the catechising of neophytes and children. Round them were their dead, their loved ones, nay, round them were their martyrs, the men and women who were to prove that “the blood of the matyrs is the seed of the Church”; whose heroic deaths had been witnessed by many; the memory of those heroism was to prove almost as potent as ocular witness when their burial-places became the nuclei of the first Christian churches, and the abounding reverence felt for them inaugurated the Christian cult of the saints. 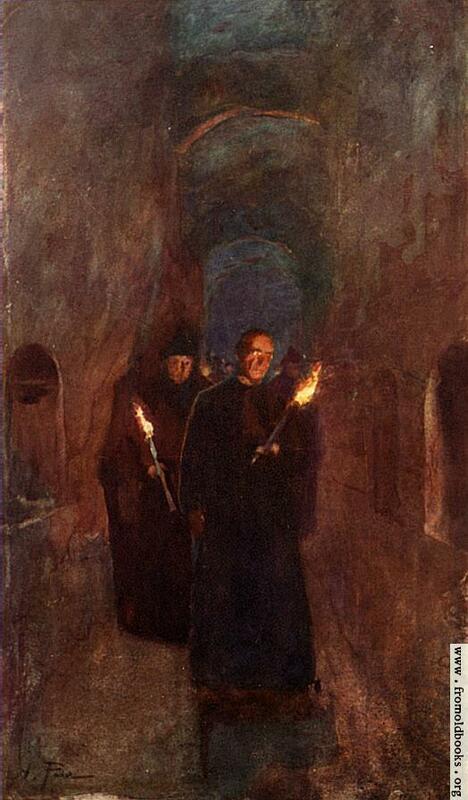 The catacombs lie for the most part within a three mile radius of the wall of Aurelian. They number forty-five [as of 1901; is this still true? 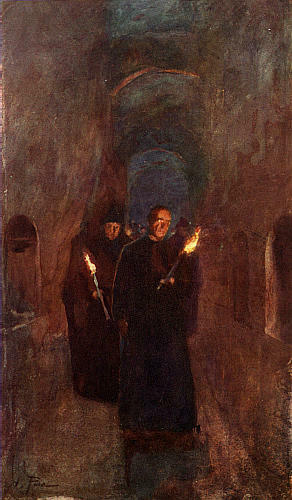 – Liam], and it is calculated that the passages, galleries, and chambers of which they consist cover several hundred miles, forming a vast underground city—“Subterranean Rome.” For the first 300 years, until “the Peace of the Church,” this was the ordinary place of burial, certain catacombs being affiliated, from the third century, to the ecclesiastical regions in the city. Even after the “Peace” Christians were sometimes buried here, until the fifth century, after which the catacombs were visited as places of pilgrimage for another 400 years.